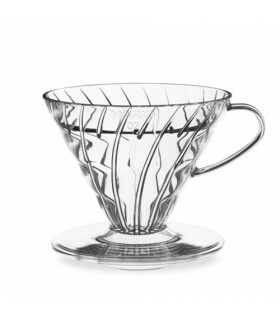 The Hario Fretta V60 Iced & Hot Coffee maker uses the pour-over drip brewing method to make delicious iced or hot coffee. 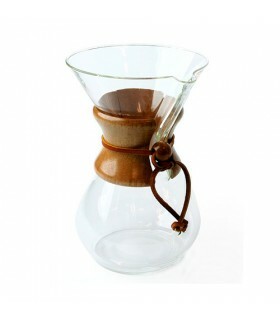 By arranging the dripper cone over the plastic diffuser on top of the glass carafe, all of the components are lined up for brewing and cooling in one easy process. 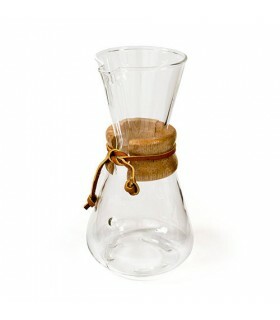 To prepare ice cold coffee, fill the filter with grounds, assemble and then pour hot water. Wait a few minutes and your coffee is ready! By combining the traditional pour-over drip brewing method with an iced cooling tower the coffee has amazing aroma and flavor retention. In case you want a hot cup coffee, just ommit the ice and you are set to go ! 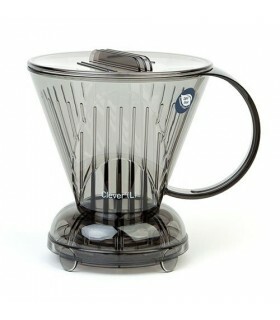 The Fretta's unique design combines a 02 size dripper cone with a 700ml glass carafe (practical capacity). 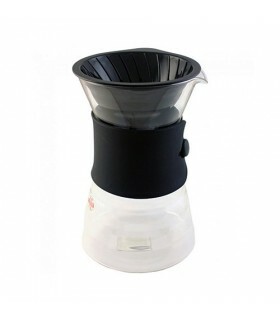 Curved ridges on the inside of the cone aid in the control of water flow as it interacts with coffee grounds. The plastic diffuser allows for quicker cooling and a more balanced flow of coffee over the ice, resulting in less melting. The package includes a package of 10pcs V60 paper filters 02.